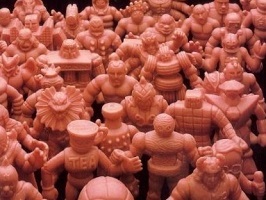 We are now 8 volumes into Kinkeshi Premium with now 120 figures in the set not including the Gashapon figures and I’m starting to get the feeling that Bandai are either running out of new figure sculpt ideas or they are following the original figures path and producing multiple sculpts of the same figure. Why do I say this? 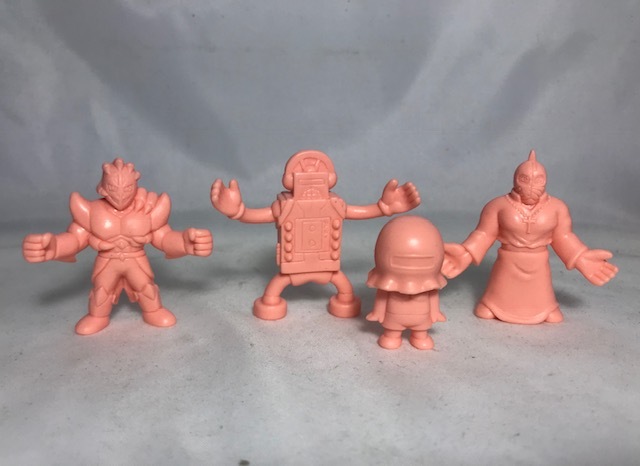 Well Vol.8 features 7 figures that have been released in another form previously. I’m a bit disappointed in that to be honest. Vol.8 has been the biggest letdown in the series in my opinion. However there are still some highlights, just not as many as previous volumes. So let’s get into the figures shall we? 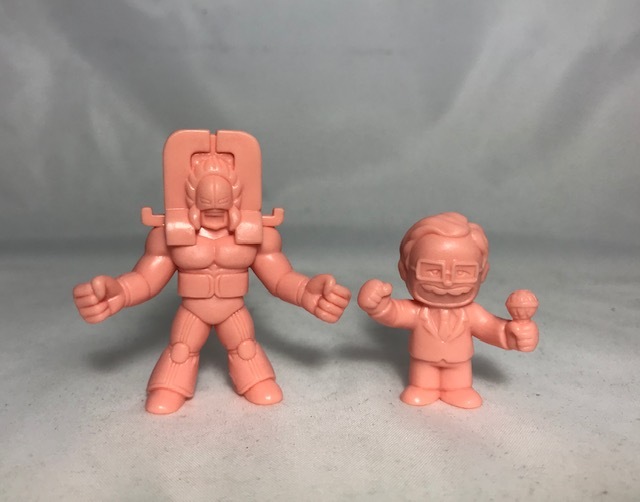 The biggest highlight are these 2 figures making their first Kinkeshi Premium appearances – The Manriki and the Announcer. Both fantastic sculpts and long overdue for the series. It doesn’t hurt that these are personal favourites of mine. The Manriki is so good I’ve had a custom paint job applied to one. Easily the best of the set. The next highlight for me are the 3 brand new sculpts. I do look forward to completely new figures in my Kinkeshi Premium box sets. The one on the left has a turtle like shell on his back which forms part of his armour, pretty cool futuristic type guy. 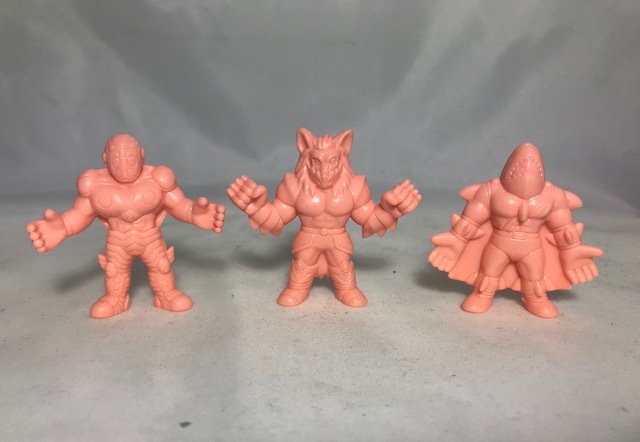 The one in the middle is my personal favourite here, a wolf like figure with a mask over part of his face, great idea for a sculpt! The one on the right is less exciting, a face inside a shark head and a cape, unusual combination if you ask me. The set then goes downhill from here though. 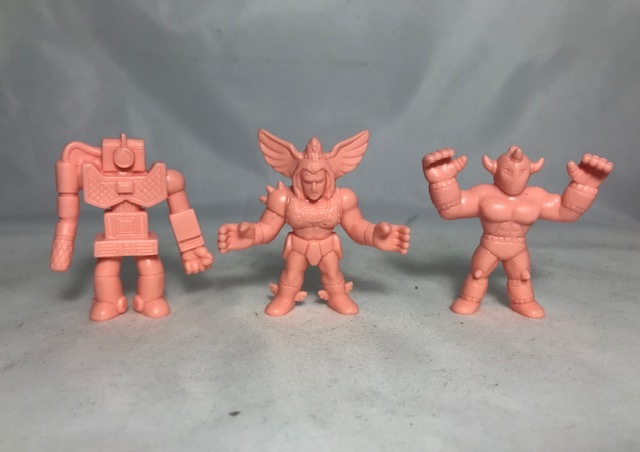 We get 2 solid sculpts in Mr VTR and Hawkman, I might be a bit harsh here but I’m not jumping for joy over these guys, a bit ho hum. Glad they are in the set but filler type guys. Better than what comes next though. Akuma Shogun with Buffaloman Arms/legs. For those counting this is the 7th….yes 7th Akuma Shogun figure. It’s just a bit overkill now. Is he really that important in the storyline? I mean I’ve seen the Anime and he appears for maybe 6 episodes out of 86 I’ve seen. I’m getting sick of seeing him. The next lot gives us our 2nd Omegaman, 3rd Stereo Cassette King, 4th Warsman though at least this is a baby type version so that I can forgive. 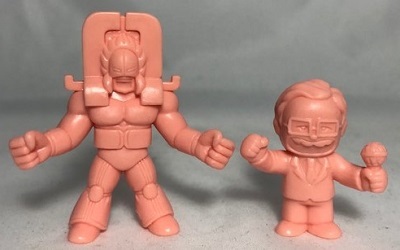 We have then 2 different Kinnikuman Soldier figures, one in a priest outfit and a normal one with a different facial expression than the other one available, sheesh! The last 2 are another Big The Budo, this one without his cane/sword. Really, why bother with this one? There is so little difference between the 2 figures, quiet pointless. 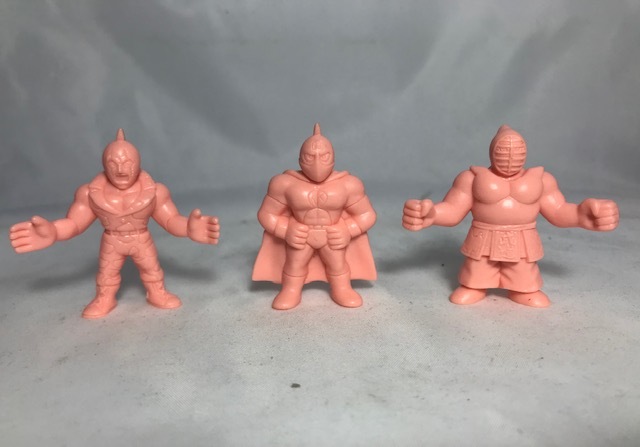 Lastly we have the obligatory Kinnikuman figure for the series, he’s okay I guess. I have been harsh in my assessment of the Vol.8 but I’m just a little disappointed in what was produced in this set. It feels like to me the production team was on a short timeline and needed something to market fast. This entry was posted on Monday, January 28th, 2019 and is filed under UofM News. You can follow any responses to this entry through RSS 2.0. You can skip to the end and leave a response. Pinging is currently not allowed. Totally agree – these are getting worse and worse as sets – though there are definitely highlights. I am losing faith and nearing the wish that they would stop for a year or two. I’m not alone – I work in downtown Tokyo near a Jump shop. They stocked all the gachapon machines for the figures until the recent versions where everyone is sitting down (boring) and don’t carry series 10. They give space for gachapon to other Jump series figures instead.